Changhun Kim 6d (right) of Korea has won the 36th World Amateur Go Championship, held this year for the first time in Thailand. 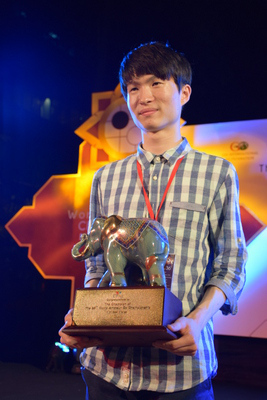 In second was Aohua Hu 6d of China, and third place was taken by 12-year-old Jyun-Fu Lai 7d from Chinese Taipei. The remainder of the top-ten finishers:  Chi-hin Chan (Hong Kong),  Satoshi Hiraoka (Japan),  Cornel Burzo (Romania),  Artem Kachanovskyi (Ukraine),  Juyong Koh (Canada),  Pal Balogh (Hungary) and  Daniel Ko (United States). Click here for the full tournament results and the final-round report. Other reports include Round 6: Hungary vs Belgium; Korea Storms Ahead on Third Day of WAGC & Round 4: China vs Korea.